Sony, based in Japan, is one of the leading consumer electronics companies in the world. Sony has been a pioneer in display industries for many years. 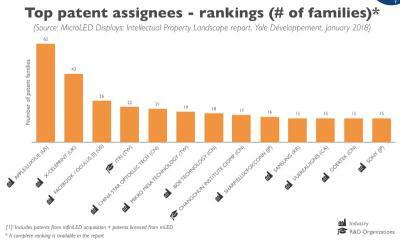 In 2012 Sony demonstrated the first micro-LED TV (55", Full-HD) which they termed Crystal-LED. Sony's 55" Crystal-LED never reached the market, but in 2016 the company unveiled its large-area outdoor micro-LED displays which Sony calls Canvas Display, or CLEDIS. CLEDIS displays are based on modular tiles (each 403 x 453 mm in size with a resolution of 320x360). The pixel pitch is 1.2 mm and the emitting area is 1% - which enables very high contrast ratios. The peak luminance of CLEDIS displays is 1,000 nits. The company is shipping these displays commercially and demonstrated two large CLEDIS displays at ISE 2018. 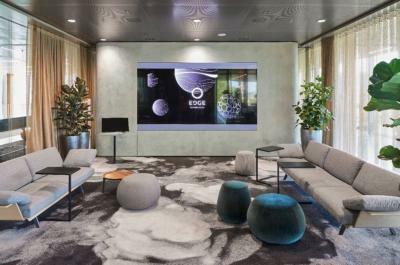 The Netherlands-based sustainable building developer EDGE Technologies has installed a Sony Crystal LED display at the company's headquarter, the EDGE Olympic office building in Amsterdam. The custom-build display at the EDGE office is 3.2 x 1.8 meters in size, with a resolution of 2560x1440 pixels. Sony's Crystal LED is built from tiled 403x453 mm (320x360) micro-LED modules. Sony demonstrated two of its Micro-LED Crystal-LED "CLEDIS" integrated displays at ISE 2018. 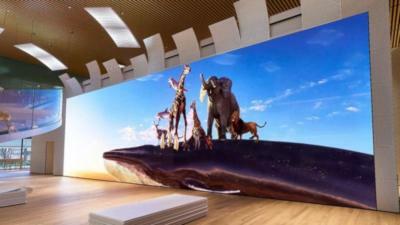 Sony's main displays at ISE was a large 8K x 2K Crystal-LED display, that reportedly was very impressive. Sony also demonstrated a small "Baby" Crystal-LED display, about 120-inch in size, at its booth. According to Sony employees at the booth, the large CLEDIS took around 50 hours to build, and the cost of such a display is around $1.8 million. The smaller CLEDIS at around 120" will cost bout $500,000. I wish to thank Omar Ayers for providing the photos and the information from ISE. Japan-based Yano Research Institute estimates that following Sony's launch of its CLEDIS display, the Micro-LED market will finally emerge this year. Yano sees the micro-LED market growing from $7 million in 2017 through $14 million in 2018 and $224 million by 2020. The fast growth will continue, and the micro-LED market wil reach $4.5 billion by 2025 - that's a total growth of over 65,000% from 2017 to 2025.